David Stubbs began working in the finance department of the British Atomic Research Establishment at Harwell in Oxfordshire when he left school. A passionate racing fan he was delighted when - in 1978 - Frank Williams and Patrick Head decided to set up their new Williams Grand Prix Engineering operation in an old carpet warehouse in Didcot. Stubbs and another Harwell man - engineering apprentice Ross Brawn - both applied for jobs and while Brawn began to work with Patrick Head, Stubbs found himself employed as a van driver, fetching and carrying for the new team. It was not long before the young man had been given more responsibility, being put in charge of the stores and later becoming involved with the team's purchasing department. As the team grew so Stubbs found himself propelled up the ladder and in 1985 he was appointed team manager to replace Peter Collins who went off to be team manager of the restructuring Benetton team.For the next three years Stubbs ran the organization while drivers Nelson Piquet and Nigel Mansell fought over the World Championship. His responsibilities increased still further when Frank Williams was paralyzed in a road accident early in 1986.It was a period of extraordinary success for the team but at the end of 1987 Honda switched to McLaren and Williams found itself with customer Judd engines. It was a setback and a number of the old faithfuls at Williams decided at the end of the year that it was time to leave. Stubbs moved to Brabham - which had taken the 1988 season out of F1 - but was planning to come back in 1989 with drivers Martin Brundle and Stefano Modena.It was not a good year and at the end of the season Stubbs decided that he had had enough of Grand Prix racing and wanted a more solid and rewarding job. He was approached by Paul Stewart and asked if he would be interested in managing the new PSR Formula 3000 team and decided it would be a good opportunity. The team started out running Andrea Chiesa and John Jones but by 1992 was becoming competitive with David Coulthard, although the team did not win its first race until 1993 when Gil de Ferran was the number one driver.It was natural that when Jackie and Paul Stewart decided to start their own Grand Prix team that they should decide that the best man to manage it would be Stubbs. 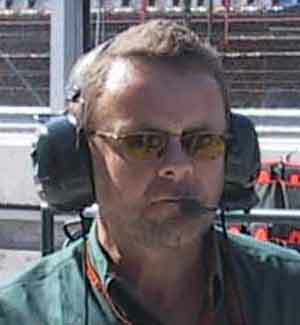 Stewart Grand Prix started competing in 1997 and, after its takeover by Ford in 1999, Stubbs was retained as team manager of the newly-constituted Jaguar Racing. He remains in that role.